On March 5th, Forrest M Bird Eighth graders climbed aboard the bright, safety-yellow school bus and rode out to Round Lake State Park, where 20 FSPW Volunteers awaited, strategically stationed for their arrival at the FSPW Winter Tracks field-day event. Ranger Chuck Gross welcomes student visitors at the Round Lake amphitheatre. Photo courtesy: Kristen Nowicki. 54 Students filed from the school bus, a backpack-strap slung over each shoulder, and into the crescent arrangement of wooden benches that comprises the park’s unique amphitheatre. The late-winter morning was chilly, but the snow had since melted with spring-trending temperatures, and a warming fire crackled at the stage front. Introductions by FSPW Project Coordinator Kristen Nowicki and Idaho State Park Ranger Chuck Gross welcomed the students to this first-annual FSPW Winter Tracks field trip day at this state park, which boosts a historical structure, an interpretive room, and a park focus on preservation of the habitats and ecology present within park boundaries. The students then “rainbowed” out into color groups, Red, Yellow, Green, or Blue, and sought out their colorful FSPW Volunteer Guide, who would lead their group of fifteen to each of four “Winter Tracks Stations” throughout the day. Thanks to Diane, Holly, Sandy, Patty and Dave for being great Leaders and keeping the kids safe and on track for the day! 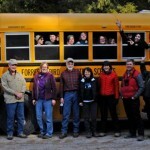 Ten outstanding volunteers put forth incredible effort to develop and present 4 outdoor-related mini-classes during this event. FSPW Volunteers ran stations spread out across the north half of beautiful Round Lake shoreline and introduced topics to the students including Wildlife Tracking, Winter Evergreens, Habitats and Niches, and N. Idaho Mammals. Thanks so much to Volunteers Celeste, Mary, Dave, Suzie, Brian, Mike, Shane, Bonnie, Ken, Becky, Dan and Mary for all the creativity, care, and attention to detail you devoted in developing these winter educational experiences for our eighth grade students. The kids were treated to a long, leisurely lunch at the lake thanks to volunteers Phil, Denise, and Peter (who was also our ‘doorman’ and video-tographer! -way to go!). These 3 volunteers were the heart-in-the-hearth for this day and warmed bodies and souls with campfire-roast favorites grilled on the fires they had built earlier in the stone chimney pavilion along the shoreline trail. With the final addition of some early afternoon sunshine, these polite, curious, and fun-loving 8th grade students from Forrest M Bird Middle School could hardly have asked for a better “school-day.” Thanks to all the Students, Teachers, Parent Chaperones, and Food Caterers that supported this wonderful FSPW Winter Tracks field day. And to our surprise and delight, our work with FMB Middle School had a pleasant after-glow on March 22nd when Travis (Logan is his other first name) Tuttle choose FSPW as his non-profit-of-choice when he won the Find-the-Pig, Win Big! Verizon educational contest. 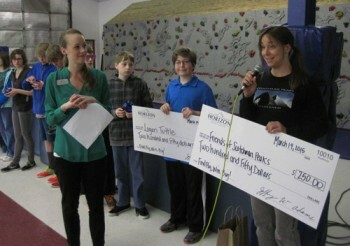 Winners of the financial ‘scavenger hunt’ learn about financial principals, get a cash award, and get to name a favorite cause to donate a matching award to. Travis chose FSPW, “because I like Wildlife,” he told us. Thank you, Travis, and Mr. Scotchman says thanks as well!!! FSPW is excited to host Travis and his peers for the 2016 8th grade class trip FSPW Winter Tracks! Congratulations to this years’ Forrest M Bird Middle School 2015 graduates, what a great group of kids! 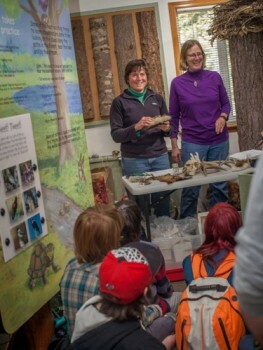 Thank you to all our students and volunteers, Round Lake State Park, and ID Master Naturalists, and everyone who lent a hand or thought throughout this years’ FSPW Winter Tracks. Have a great summer, and we will see you next year! Keep Reaching for Education, Everyone! 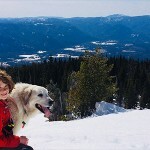 At the tender age of 8, McKenzie Smith* has undergone more disruptive home environments than most of us experience during our journey from ‘childhood’ to ‘adulthood.’ Her family’s struggles have brought them to their current status enrolled as clients in a local, non-profit welfare organization. This organization works to assist homeless and challenged families regain their feet after a period of rocky life occurrences, especially families with young children suffering from such instability. Most of the families enrolled in the program are single parenting one or more children, and many of the kids positioned here have been in transitory living conditions for years before reaching this safe-home. You see, McKenzie is my neighbor, as are many of these family clients, living in a large, house-like apartment building on the street corner near my home. The kids walk to school around the block alongside my own children, as a weekly elementary school volunteer I see them in the classroom, and I see them outside playing many evenings throughout spring, summer, and fall. I didn’t know any of them very well when I first moved here two years ago, which was just 2 months before I started work as a Project Coordinator with FSPW. 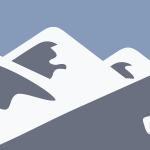 At work, I was surprised to hear about the cooperative opportunity with this organization that the Program Manager of our wilderness advocacy group had been fortunate to come across and develop. He explained to me that my new project for the summer was leading hikes with children enrolled in this local program… in other words, my neighbors. Quite frankly, it was easy to be a bit skeptical. Since I have had the chance to observe them rather closely (really I have not much choice), it is clear their parents are preoccupied and burdened with life tasks, as the kids are outside a lot, and in many instances alone. They are loud, a lot of the time. They squabble. Their exasperated parents come, yelling at them out of a place of mis-handled concern, and I can only imagine how difficult the tasks facing these families must be, how hard it must be to focus when you can’t even find work. The kids sometimes find things to do in the chain-link fence demarcation that is their backyard, but are often left to bide time in the front yard, and traipse out in the street when they are unattended to. Would these kids really give two-hoots about being driven out to the wilderness to be stuck with some strangers in the woods? Or even want to? Would they be able to mind simple rules for behavior and stay interested for a whole day? Well, it turns out, they did! These kids were absolute natural phenomena out-of-doors. When we got them on the trail, they were full of energy, they were curious, they were clumsy, and they were just simply great kids happy to be out together doing something different. They liked the flowers they saw, the little water seeps running through the trail, BUGS, large cobbles to hop on top, sticks that resembled walking canes…. Every two weeks, when it was the day of the FSPW Kids’ Community Hike, I never knew which kids, or how many kids, would show up. And every two weeks, without fail, I would be greeted at the rendezvous by a big huge van buckled full of ‘em. Many kids came out on all trips. Others joined some but not all. But smiling, always smiling, were the participants who showed up on those mornings, ready to explore wherever we would take them. 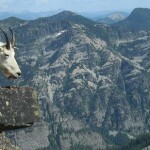 W e traveled throughout locations in the Scotchman Peaks Wilderness, from the ancient Ross Creek grove of cedars, to the mighty Lightning Creek watershed, to the historic Star Peak Trail #999. The kids did everything they could get away with: ford crisp cool streams, balance over log bridges, hideout in gigantic tree cavities, research elusive amphibians, free-climb large cobbles, face their fears creeping through narrow tree-trunk tunnels, create contests skipping stones, dissect a decaying stump, find honest appreciation for the shade of a pine tree, and discover more about themselves…that they are capable of climbing mountains! The kids were not bullies, not rude or sarcastic, not disrespectful. They were curious, light-hearted, and explosive! They brought heavy packs with them, its true, but by the end of the afternoon they carried what they could and shed the things they no longer needed, with attentive adult role models helping them along the way. The children enjoyed the special time spent playing and hiking together with kids they knew, kids who knew them. 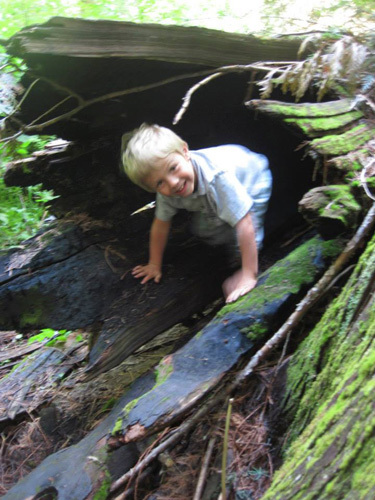 Certain shared moments will likely stick with them throughout their lives, because for these kids the opportunity to simply get out and play in the woods does not come every day. And in case these memories alone aren’t proof enough, I have a 2’x3’ scroll of paper saved that I found on my doorstep one morning with their signatures and smiley-faces on it, all telling me they were grateful to have gone hiking in the summer. I’ve felt for a long time that you never really know someone until you take a hike in the woods with them, because out there, in vast forests and alongside rivers, our society’s ‘playing fields’ are leveled; the equalities we share becomes almost palpable. We are all that we are, right there in that moment, with our feet on the same dirt path, under the same cloudy sky, the surface of our skin feeling the same breezes, and the same horizon before our eyes. We are united in our place and time, and in our humanness. Last summer, these children shed all labels I, and others in society, had placed on them. They were children of this earth, they had a home, and they all belonged. What I didn’t expect: they knew it too. Even if as an instinctual ‘sense,’ this knowledge resonated in them. 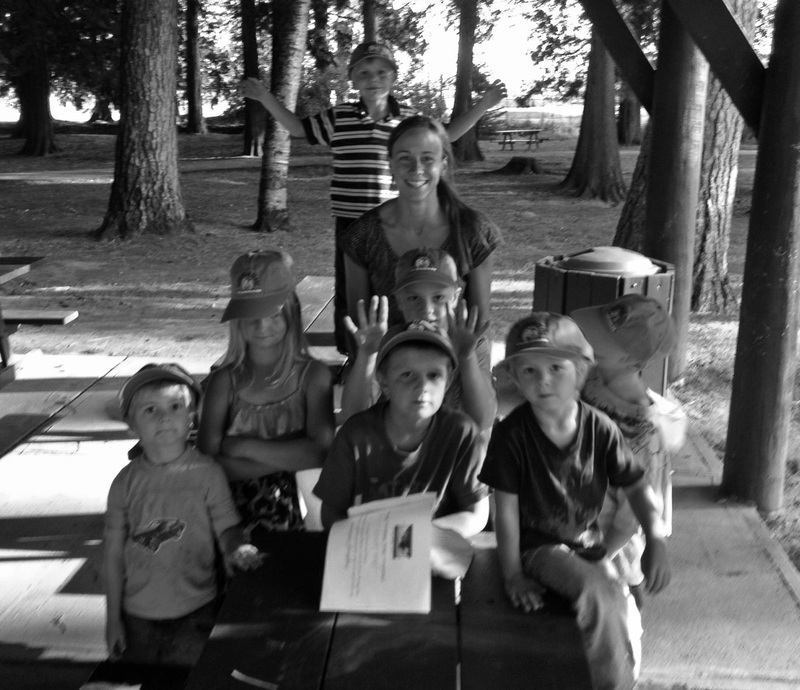 The months spent hiking together was for these kids, and in reflection for myself as well, a real summer jubilee. At the end of last summer, I bought one of those outdoor, stand-up basketball hoops for my two sons at a 2ndhand sale. Nowadays the kids from across the corner come out and play ball with us on evenings when the weather is nice. I still see them in the elementary school where I volunteer each week. And sometimes we cross paths at the neighborhood marketplace. But now when we meet, it’s just a little bit different. I see things in our passing-by that I didn’t notice before. I see that, in those shy little waves, I provide a community connection for them as a part of a larger group of people that lives here, a community they are a part of. I see them feel confirmed and safe, nodding their heads when I interrupt their games to discuss acceptable behavior rules, because they remember I like playing with them. I even see them divert their eyes if they weren’t behaving well, because they feel accountable now knowing someone who cares is watching. McKenzie asks me when we are going hiking again. When these families complete their program, I hope I continue to see the kids from the ‘big house’ around the schoolyard and in the classrooms, maybe at the parks or playgrounds in the summertime. And I hope these every-day encounters will remind them of their inhabitance within our greater earth-community, similar to all humans as it is all nature, a community which they were born of, inherit, and will one day retire to, with all this Earth does give them along the way: clean water, fresh flowers and fruits, unique minerals, interesting creatures, and maybe most importantly of all, each other. FSPW kicked off 2014-15 winter educational programming this past Saturday at the Community Center in Heron MT. 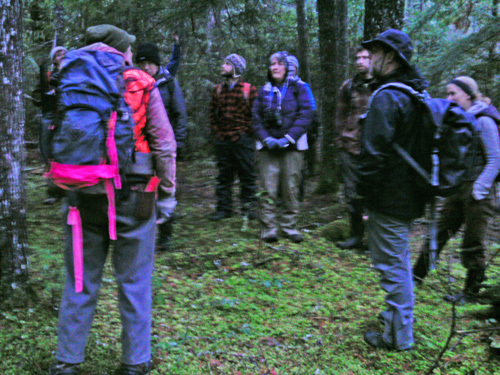 Faced with the challenges of a warm beginning to winter, Naturalist Brian Baxter easily perservered, bringing his wildlife knowledge, tracking ‘tricks of the trade,’ and a lot of fun energy to a great group of volunteers and instructors who will be participating in FSPW’s Winter Tracks program this season. 8 FSPW Volunteer Trip Leaders attended this kickoff event in order to gain understanding of the layout of the course our youth participants will be engaging in beginning this January, their roles as trip leaders, and to refine their skills in wildlife tracking and ID, sign interpretation and camera recording station set-up. 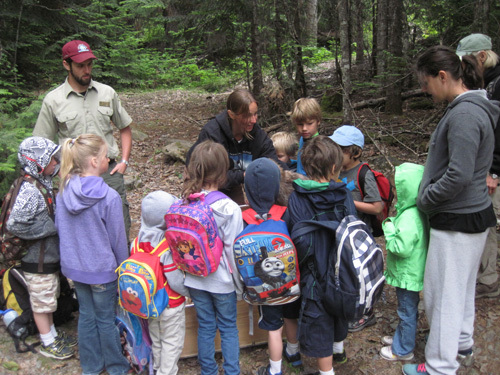 Class began with a 2-hour classroom review of animals common in North Idaho, their family groupings and their track features. Brian introduced terminology commonly used when discussing animal signs/tracks and entertained participants with animated discussions regarding the how and why of track patterns wildlife create. Brian created several attracting displays to lure in animals, utilizing organic sources in this ground display. Name this camera setup detail: Motion Camera, Visual Lure, Local Lure, Reference Material…. through the woods to the class’s winter wildlife recording site. 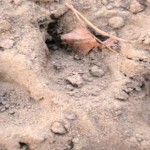 The class discussed the habitat features they identified, and these features’ implications for wildlife. Eventually the class congregated around a small secondary drainage feature on a NE hillside, at a small bench in the topography, all around us a mature stand of Hemlock carpeted with soft, light green layers of feathery step-moss. At this spot, Brian unloaded his gear bag and described to us some (but not all!) 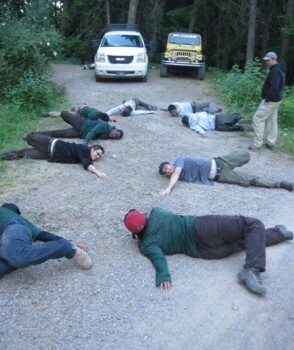 of the tricks in his kit for deploying wildlife study sites. A variety of olfactory lures and visual attractants were discussed with the class as well, then temporarily installed around the site in strategic manners. 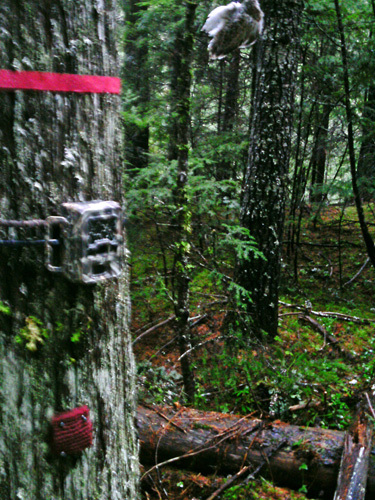 Participants set up motion-activated cameras at the right angles around the site to capture potential wildlife activity over the next few weeks. Volunteers Mary and Elisa track along the sandy Clark Fork riverbank. 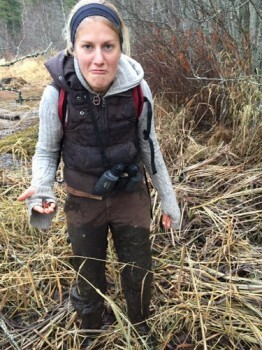 Curiosity killed the cat, but volunteering only gets folks a little wet and muddy. astute group. 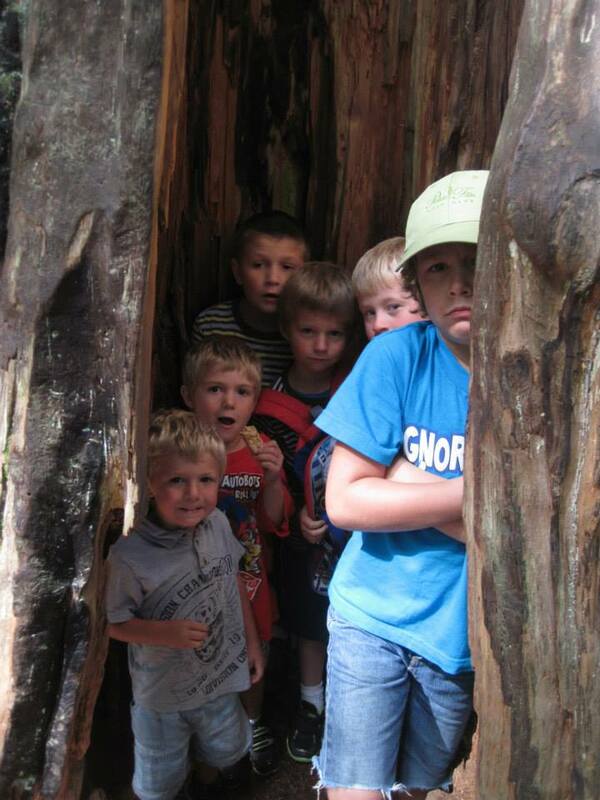 This group was so into seeking out sign, that they occasionally immersed themselves in their environment. Like, about thigh deep, right Suz? Overall, the weather stayed clear and made for a great day with good discussions and questions, and the group’s continuing spirit of discovery has prepped these talented volunteers for our school group field trips coming up in January and February. THANK YOU TO OUR OUTSTANDING VOLUNTEERS!!! Your generosity and commitment to this project positively impacts our hometowns, our greater community of wilderness stewards, and our future. Thank you to everyone who helped us with this series kickoff event! 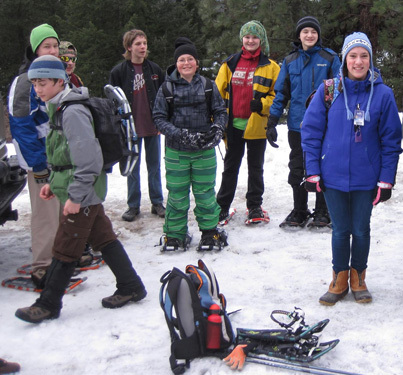 The FSPW Winter Tracks program is a youth-focused outdoor education field trip mini series. 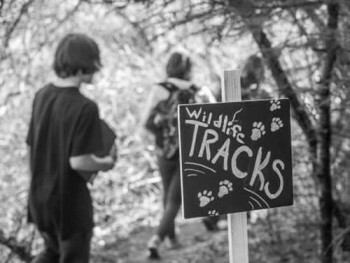 Students grades 5th-12th will visit public land sites and be given the opportunity to perform winter experiential activities including wildlife tracking and recording with professional educators and knowledgeable volunteers. Public, private, and general public youth audiences are welcomed and encouraged to attend! If anyone is interested in assisting this project as a volunteer or a participant, please contact me! Kristen@scotchmanpeaks.org . We would love to get you involved in giving back this winter! Last years’ FSPW Volunteer Group of seventh graders are planning to attend our winter educational programming again this year. Look at those smiles! Citizen Scientist Front: Preliminary Weed Mitigation Results Positive! 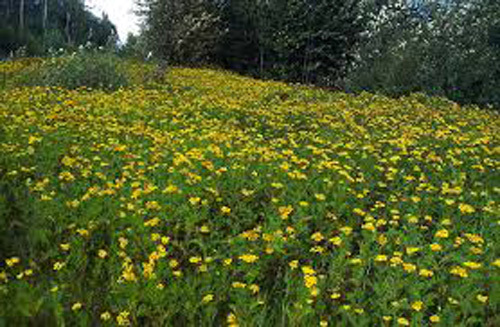 FSPW Wilderness Stewards are seeing promising advancements this summer in the noxious weed abatement efforts of the Treasured Landscapes Campaign. 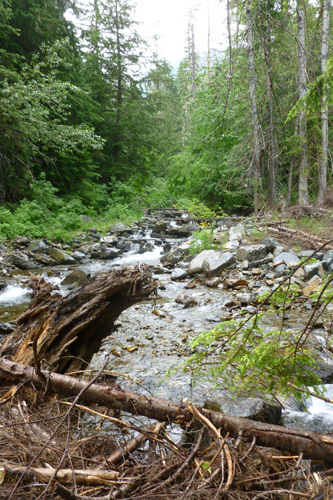 This is Phase 2 of a sizable, 3-Phase Restoration project aimed at mitigating threats to the pristine nature of the Lightning Creek Drainage Complex, and subsequently much of our proposed wilderness area. 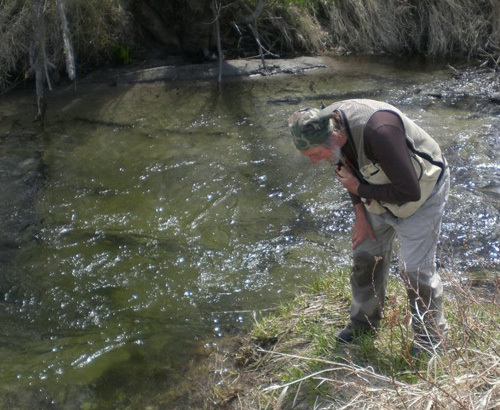 The Lightning Creek Drainage was chosen over 100’s of other locations due to our incredible local volunteer base and outstanding community of concerned citizen scientists. A part of a greater, pioneering movement toward wilderness stewardship by local communities, the Friends of Scotchman Peak Wilderness get it done, and our work has received national recognition under this recent Treasured Landscapes award. This 2014 season, it is inspiring to see our work’s fruition. 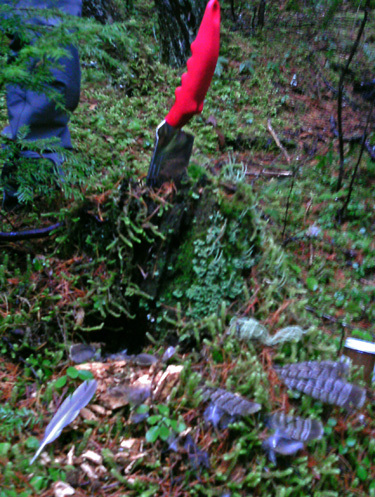 A little background on what we accomplished in 2013: approximately 20 volunteers teamed up and hit the trail to perform invasive weed surveys on 8 recreational trails in the proposed wilderness. 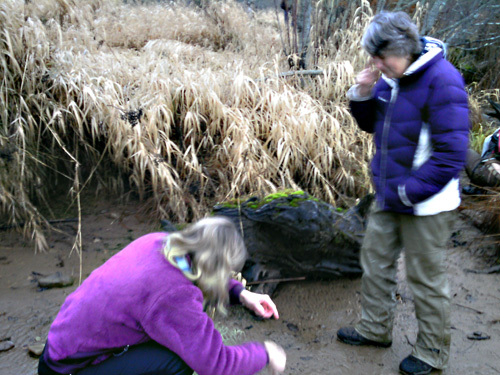 We covered nearly 50 miles of trail, and found several species of noxious weeds and some large infestation areas. 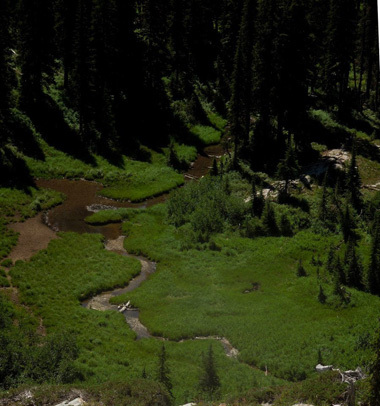 This data was sent to the Rangeland and Weeds Specialists at the USFS Idaho Panhandle National Forest. “Gail Bolin and I wanted to say how positively different the old roadbed is this year after Ken Thacker’s careful weed treatment! We saw a lot of dying weeds and new growth in natives. Ken seemed to have missed the natives in his treatment, which takes a lot of skill and care. This trail had been dispiritedly weed infested in 2013, and now is quite pleasant to walk. With very few exceptions, we noted weed infestations as “sparse.” The target plants are often rhizominous and have deep and complex root systems. Thanks to returning volunteers and Weed Warriors Molly O’Reilly, Gail Bolin, Fred Gaudet, Jim DuBisson, and Derrek Antonelli, as well as Treasured Landscape newcomers Jenn Vanvolkenburg, Becky Renolds, Shane Sater, Celeste Grace and Mary Franzel. 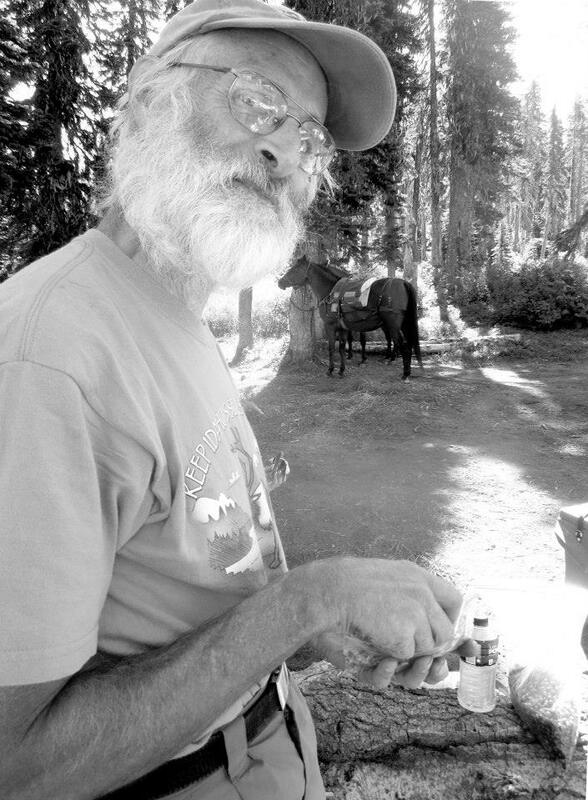 Your work has been a great help to Ken, our wilderness and wildlife ecology, and local wilderness recreators. It is amazing to see what we can accomplish when we all pull together for a common goal!! Over the next two months, work will occur in Phase 2 of our White Pine Headwater Forest and Stream Stabilization restoration projects as well. Stayed tune for further results in 2014’s Treasured Landscapes progress! At 4300ft elevation wild sarsaparilla faded out, while the terrain held strong. 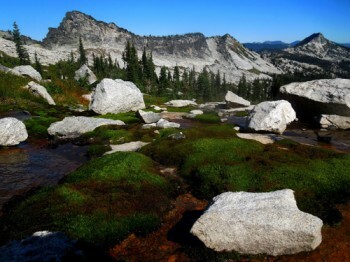 Scratchy, porous, ruby brushed rocks appeared housing beargrass communities of subalpine fir and huckleberry, with the noble shrubby-penstemon filling more faded enclaves. The ridges are long and claimed by windthrown species of lodgepole and slow-growing whitebark pine honoring the perseverance of hardship endowed by their arboreal origins. I feel the cliff before I approach it. A rapidly narrowing bench promises satisfaction to my curiosity; my feet work quickly to keep pace with my body as I careen up the ridgeline. Entering the breeze that was gifted by the break, I am careful with my steps. The ground ends suddenly here, and the views become heavenly. In the gradient of blues composing this mountain-scape, tributaries begin to make their presence known in the first humble folds of rock. 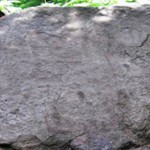 Your eye can trace them and observe their deepening foldings, overlapping in ancient tales of evolution. Our land use is a choice we continue to make. I am grateful for the places that remain where my sight may be graced with the rugged, raw materials of north Idaho and western Montana. Through sound planning and management practices, we can achieve a spectrum of policies and procedures that include conserving these raw material oases. My feet are heavy. I set down my pack, facing the setting sun. I peel my leaden boots from my feet, and place them to the side. Songbirds nesting in nearby subalpine fir begin chirping. I lean against my pack, breast to the sun, and watch the world come alive. For now, I enjoy our present, and I make a quiet wish for our future. Winds in the Wilderness: This Land IS Your Land! Happy Independence Day, Friends! 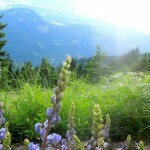 I hope you all had some chances over the sunny holiday weekend to enjoy this beautiful country, be it from the summit of the mountain, the waves of the lake, the cool refuge of a forest grove, or even your own backyard. It’s important to take time to enjoy this country, an homage to all the work our United States Citizens do to protect and preserve this greater America (and maybe a little time for fireworks!). Thank you everyone for your commitment to our cities and towns, woods and waters!!! Parades were everywhere over the holiday, and Friends were out marching in festivities all over the region. 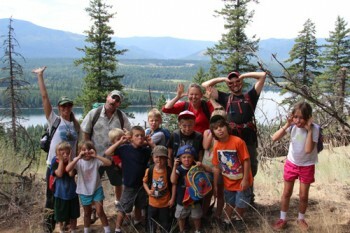 Volunteers walked in Sandpoint, Clark Fork, Noxon and Heron, all in relentless sunshine, to support our wilderness land. 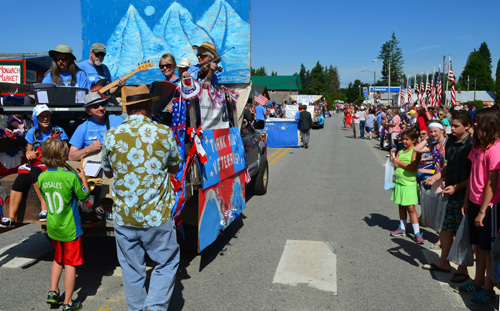 Volunteers and FSPW Supporters marching in Clark Fork enjoyed another fun year crafting a spectacular float, complete with a beautiful landscape painting, Mr. Scotchman at the head, and a several-piece band. 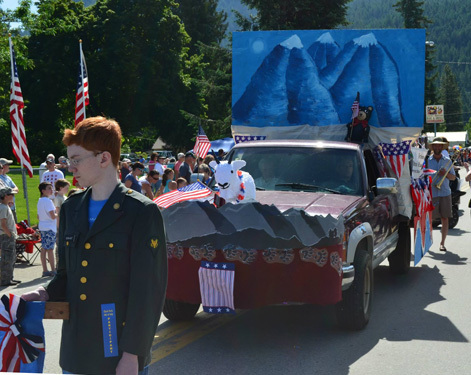 Their endeavor earned them a trophy recognition for 2014 Best Adult Float. Way to go, guys! Rest up Friends, because summer is here full throttle and next weekend will be a celebration to remember! 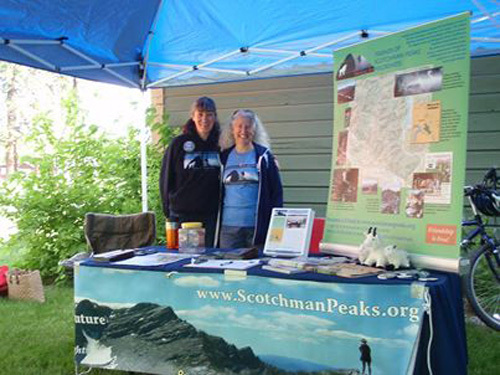 With the 50th Anniversary of the Wilderness Act being honored this summer, FSPW and partnering organizations are cookin’ up a weekend of events, with hikes, guest speakers, puppet shows for the kiddos, food and live music. 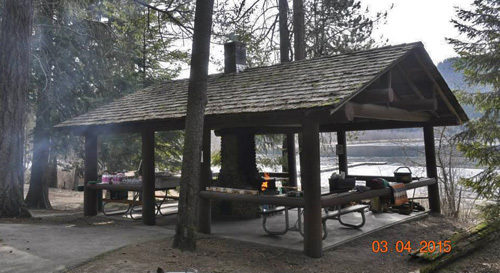 It all starts Friday, so check out the schedule of events and make the gorgeous drive out to the Bull Lake Rod and Gun club, our gracious hosts for this outdoor party! Milepost +/-18 on Hwy 56, nestled in the western valley before the breathtaking Cabinet Mountain Wilderness. 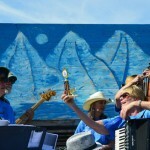 Before digging into this weekends’ events, I’d like to sound a great big “Thank You!” for last weekend’s outstanding outreach volunteers participating in some great returning local events: the Kinniknick Native Plant Society’s annual Arbor Day Plant Sale, and the second annual Pend d’Orielle Bay Trail Fun Run. FSPW Volunteer Outreach makes huge strides in accomplishing our mission! On Saturday, FSPW greeted garden enthusiasts who were up early sifting through new spring blooms at Memorial Park in Sandpoint, during the KNPS’s Arbor Day Celebration and Plant Sale. The following morning, FSPW volunteers were stirring once again, this time joining our Friends of the Pend d’Oreille Bay Trail for a fun community race event benefitting this much-loved trail along Sand Creek in downtown Sandpoint. Thanks Deb Hunsinker, Randi Lui, Carol Jenkins and everyone else who extended their energy and influence for our beautiful community last weekend. 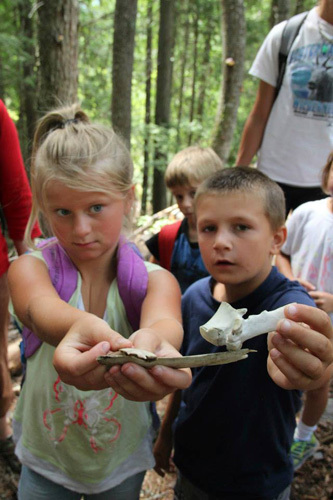 Project Coordinator Kristen Nowicki shares a wilderness treasure chest and talks with kids about how to use our senses to observe the environment around us. Kids take a well-deserved break! CW top to bottom: Project Coordinator Kristen Nowicki, FSPW Wilderness Ranger Joe Zimmerman, FSPW Volunteer Holly Clemens, and TIPS Staff Tami Martinsen. This weekend, Friends volunteers drove out of the city limits to enjoy the onset of summer in the wilderness, now brimming with life. 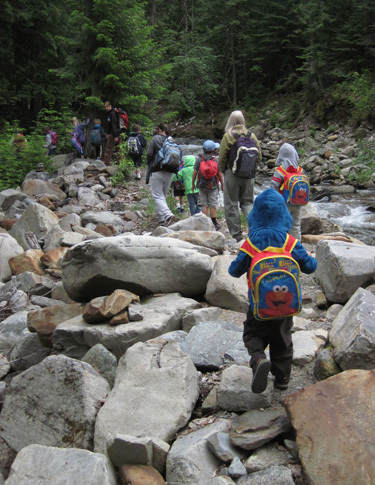 FSPW, in partnership with Transitions in Progress, conducted the first in a series of Community Kids’ Hikes this Friday that will be ongoing throughout this summer. Volunteers and Staff from both organizations met at the Morris Creek Trailhead in the Lightning Creek Treasured Landscape drainage, along with a van load of anxious young explorers. By the time the group had advanced a mile down the trail, the eager kids had discovered a host of exciting and dynamic wilderness components: from large, strong flowing rivers and inlets, old root masses resembling antlered wildlife, and boulders, to progressively smaller wildflowers, mushrooms and insects scattered throughout the forest floor. They learned about using multiple senses to observe the world around them. 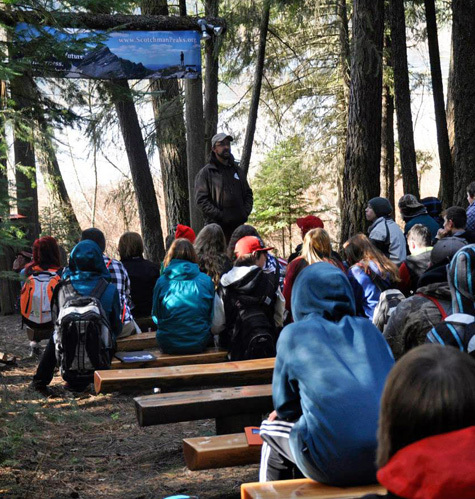 They also got to learn about working as a Wilderness Ranger, and enjoyed a question-and-answer session with FSPW Intern Joe Zimerman during our lunch break. As they prepared for the van ride home, the kids recieved FSPW Nature Journals and a small, felt “Wesley Wolverine” to share in writing and drawing about the days’ experiences. 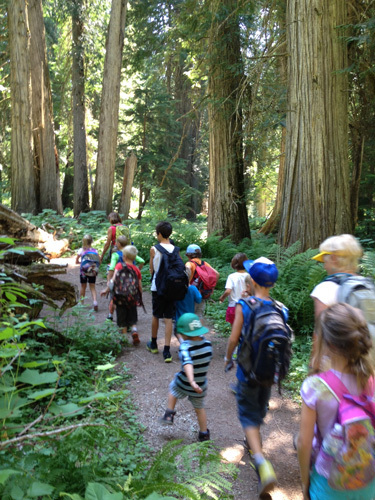 We are already excited for the next hike this coming July, when we get to explore more of our wonderful wilderness with this sweet and joyful group of Young Scouts. Thanks all you kids, Tami Martinsen and TIPS, and all our Volunteers who helped make the day great. Local Naturalist and Instructor Brian Baxter shares his knowledge of ecology with area communities. 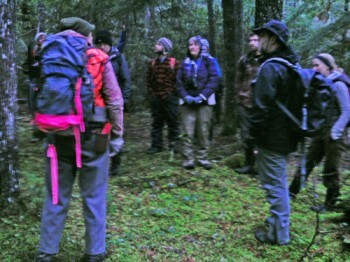 Saturday, Friends convened for an informational lecture and hike by local naturalist Brian Baxter. 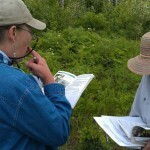 Approximately twelve participants journeyed to Heron, MT for a presentation on Botany and Wildflower Basics. 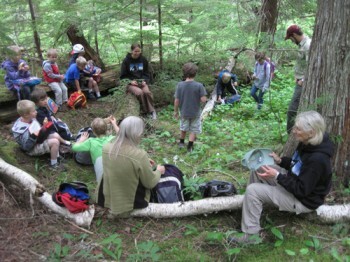 This event begin in a relaxed classroom setting and led to the trail, where participants got to experience hands-on taxonomic field identification of some of our region’s most beautiful wildflowers. Thanks to Brian and co-lead Joe Zimmerman, and all our participants who attended this event. 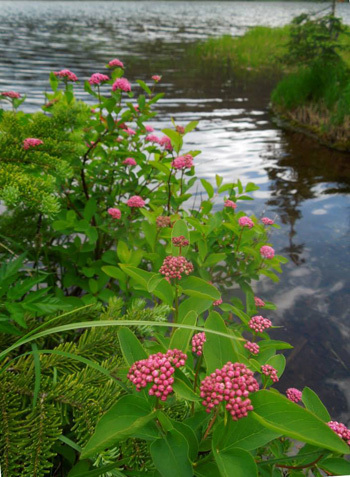 Be sure to visit our Events Page and Hikes Page and checkout some great summer opportunities to work and play and preserve our beautiful wilderness. Space is limited and is filling up quick! 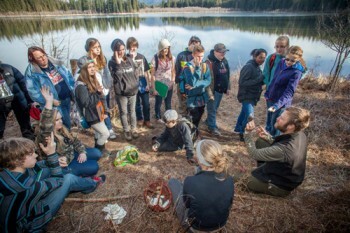 This week with the Friends of Scotchman Peaks Wilderness, Friends enjoyed a North Idaho Tree Identification Walk, The ‘Old Goat’ Awards and the State of the Scotchman’s 2014 with Heather ‘Anish’ Anderson, and began the first of two sessions in the second year of our Volunteer Training Program. 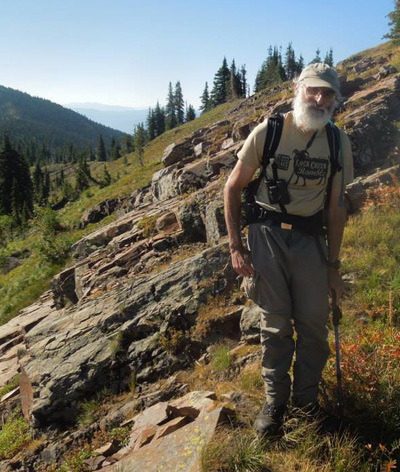 Naturalist and Orienteering trainer John Harbuck is an FSPW Guided Hike Leader, Citizen Scientist, and accomplished Huckleberry Picker. 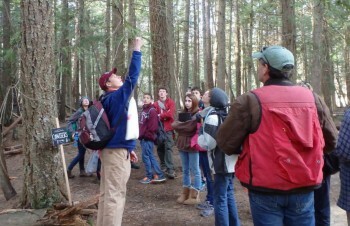 On Sunday, May 11th, vounteer John Harbuck led a group of interested folks in a tree identification walk. 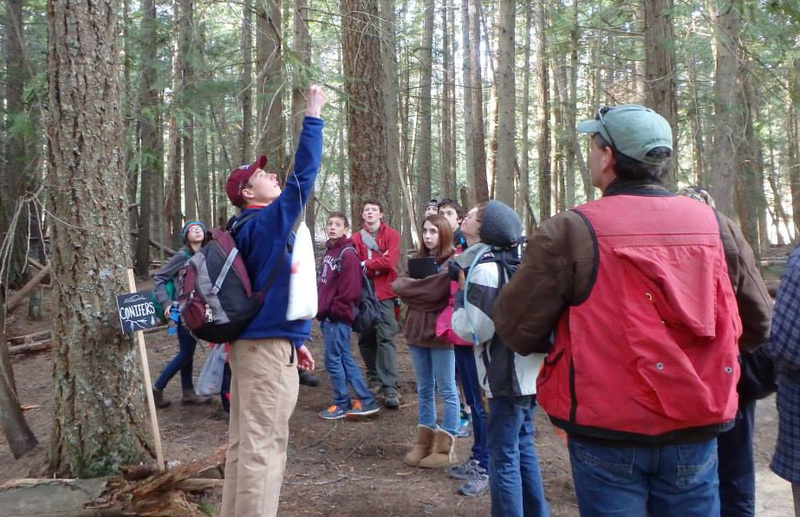 Participants learned some basic tree identification characteristics, and nearly all tree species common to North Idaho were keyed throughout the event utilizing dichotomous keys. 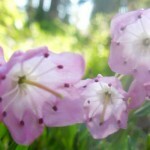 Everyone enjoyed additional bonuses such as nice spring weather and early spring wildflowers during the day’s event. After the tree ID session, hikers retired for conversation and picnic-style sack lunches. Thanks John, for sharing your space, knowledge, and enthusiasm with everyone! The State of the Scotchman’s, V. 2014, was held this past Wednesday. It was an inspiring evening honoring great volunteers and partners in our conservation work, naming the ‘Old Goat’ of 2013, and hearing the incredible journey of one very strong, determined, and grateful young women who set the speed record for the 2650 mile Pacific Crest Trail. Irv McGeachy was named the ‘Old Goat’ of 2013, due to his astute dedication to restoration of the historic Star Pear Trail. 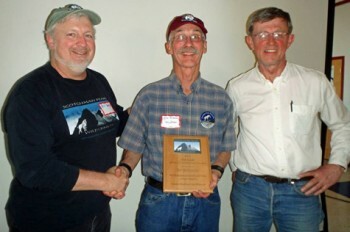 Joel Sather of the USFS was honored with an award for his diligence and commitment as a faithful partner for stewardship of the proposed wilderness. Celeste and Eric Grace won awards as well for their outstanding accomplishments in volunteerism throughout 2013 and beyond. After awards and updates, Heather ‘Anish’ Anderson began her presentation for ‘Tenacious: Setting the Unsupported Speed Record for Hiking the PCT.” The audience was moved with Heather’s compelling saga of hiking an average of 45 miles a day, setting and sticking to challenging personal goals, overcoming lifelong fears and struggles, and being blessed with the good sense to follow her heart. Thanks to Heather, Irv, Joel and the Grace’s, all our board members, volunteers and partners, and most of all our amazing community of Friends for making it a fantastic evening! Imagine finding THESE folks in the woods! On Friday, Volunteer WRFA Instructor and FSPW Board Member Carol Jenkins taught a CPR/AED certification class prerequisite to students in preparation for the Wilderness and Remote First Aid Course taking place over the weekend. 5 new program participants arrived and have been undergoing WFRA training throughout the weekend, and five more will begin their certification next week. This is the second year our organization has worked to offer this unique Volunteer Training Program. Preparing our Stewardship, Citizen Scientist, and Guided Hike volunteers in emergency response practices increases our safety and competency performing boots-on-the-ground work and activities for maintaining the health and recreational vitality of our wilderness landscape. Thanks Carol and all our program participants for making this endeavor a success! WRFA training continues into next week. 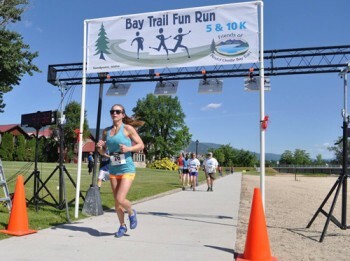 Read about all over activities and more in the newest addition of Peak Experience, our bimonthly newsletter whose most recent addition hit the shelves this week. Until next weekend, keep wild one and all!